"There are two kinds of audiences: those who want the truth, and those who revel in the illusion." This is just one of the many themes that is running through the action fantasy film 'The Great Magician,' starring Tony Leung ( 'In the Mood for Love', 'Hero') in a starring role as Chang Hsien, a remarkable magician in 1920s China seeking to reunite with the fiancé he left behind some years earlier, only to find that she has been forcibly married to a powerful warlord by the name of Bully Lei. As you can no doubt imagine, the story, adapted from the novel by Zhang Haifan, has several other themes running through it that attempt to depict the tumultuous post-revolutionary period that overthrew the Qing Dynasty and saw China's fiefdoms ruled over by warlords who were frequently at odds with one another. 'The Great Magician' sets out to convey various other ideas that seem to be representative of the time with varying success. Themes like the value of hard work, not taking shortcuts, and honor are interspersed with frequent references to the nature of illusion and an audience's willingness to either believe in the fantasy of magic or its desire to pull a trick apart as though it was a clever device intended to be dismantled. The film also makes several allusions to the nature of illusion through the use of film and cinematography, hinting at the powerful and influential medium it would later become. In fact, it would seem that 'The Great Magician' is a layered, complex film about shifting power structures within a country still feeling the aftereffects of revolution. All of those elements are on display, certainly – but, like the illusions of Chang Hsien, there's nothing real behind any of them. And it is in that void between the concept and its delivery that the film begins to fall apart. Much of the problem is that the screenplay only addresses the notion of revolution and the impact of the warlords in a superficial manner. Bully Lei (Ching Wan Lau) is the prototypical violence-driven warmonger who is more concerned with bedding his reluctant seventh wife, Yin (Xun Zhou), than he is adequately ruling his people. Meanwhile, Bully's advisor Liu Khun Shan is also brokering a deal with the Japanese that will see the warlord flush with armament like tanks and other weapons of war, but ultimately beholden to a foreign government. Perhaps the importance of Bully's dealings with the Japanese, and his seeming ambivalence toward governing in anything other than a corrupt, puerile manner is more resonant for those with a deeper understanding of Chinese history, but even then there is little evidence that much of the historical importance of the Revolution and its outcome is present in even a tangential manner. To that end, the majority of the plot is spent with Chang attempting to reunite with his former fiancé Yin, while working with a group of revolutionaries plotting to kidnap Bully and ransom him in exchange for the release of their imprisoned compatriots and Yin's father. Chang sets himself up as the preeminent magician near Bully Lei's compound and quickly becomes established for his ability to wow an audience and make his illusions seem utterly real. As Chang attempts to reestablish contact with Yin, we learn that he ventured to Europe for several years, leaving her behind while honing his skills. This sets up the film's major conflict in that Yin is being held against her will by Bully, but is reluctant to accept Chang back in her life. The audience is apparently supposed to wonder which avenue she'll choose: the aggressive warlord, or the man who abandoned her so that he could become the world's foremost magician. But like the themes spread so thinly throughout the framework of the film, the characters and their motivations appear to be constructed in the same scant manner. For the most part, characters are simple constructs intended to move the plot along toward a rather inconclusive denouement that is as bewildering as it is unfulfilling. Motivations run as deep as the acquisition of things, which are as varied as the love of another person; a scroll containing vast mystical knowledge; and authority through superior firepower. These are incentives that are widely and easily understood, but without an understanding of why any of it is important to the character in question, the narrative falls completely flat. Despite competent performances by the cast, 'The Great Magician' is simply too muddled and burdened with a surplus of ideas to make significant use out of any of them. The film spends too much time establishing plot without building compelling characters around it or any reason for it to be resolved – which is probably why the conclusion feels so empty and uninspiring. There are a multitude of gripping themes that are given only a cursory glance in this movie, which tells us that the filmmakers would have been better off picking just one and running with it, rather than overstuff the narrative with concepts they had no intention of exploring. As it stands, audiences are presented with the illusion of a complete story, when there really isn't much of one. 'The Great Magician' comes from Well Go Entertainment USA as a single 25GB disc in the standard keepcase. The disc is loaded with audio options and comes with a handful of previews for other Well Go releases. The 1080p AVC/MPEG-4 transfer is a remarkably sound presentation that imbues the picture with plenty of fine detail, rich warm color and excellent textures. 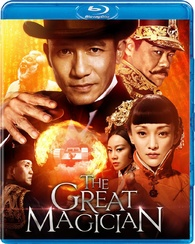 'The Great Magician' was shot on film and it certainly has captured all of the warmth of the format without a hint of grain being present in the final product. As mentioned above, fine detail is present in nearly every shot, making some of Bully Lei's more ornate costumes really pop when on screen. Facial features all look clean, precise and very lifelike, while the special effects manage to come across looking very well made and utterly believable. Background elements are clear and are easily recognized. Contrast is superb; blacks are solid without a hint of crush and the depth of the picture is remarkable. If there was a complaint, it would be the natural warmth of the picture has a tendency to become too hot on occasion, causing faces to look more flush than normal and giving the impression that anything with a red hue is going to burn off the screen. All in all, it is a nice image with great detail and depth that ultimately manages to overcome the issues that stem from running too hot at times. Viewers have the option of Mandarin DTS-HD 5.1 and the English dub in DTS-HD 5.1 (along with the same two available in Dolby Digital 2.0). That being said, the DTS offers a very nice mix – on both the Mandarin and English – that beautifully presents the dialogue in a clear, crisp manner, but ultimately serves to highlight the sound effects and the film's propulsive score. Surround effects are in heavy use during the very playful martial arts sequences, and they use all of the channels effectively to create a fun and immersive experience. LFE effects are present throughout and offer some additional depth without creating too much of a stir. Dialogue is primarily focused through the center channel speaker, but there are times when the rear channels are utilized for a surround effect that works quite well, especially during crowded sequences. Mostly, though it is the film's score that sounds the best on this mix. When the music fires up, it fills the room with rich sound and deep tones that offer another much-needed layer to the film and the viewing experience. Making The Magic (HD, 38 min.) – A comprehensive look at the making of 'The Great Magician,' which features a host of interviews with the cast and crew, and some extensive behind-the-scenes material that was shot while the film was in production. 'The Great Magician' is a film that has a great many ideas on its plate, but it fails to explore any of them to the degree that they become truly meaningful or thought-provoking beyond a superficial examination. The movie works best when the magic of Chang Hsien is at the forefront, which, like other elements of the story, could have been explored in a more resonant fashion. Although the disc provides good picture and excellent sound, the film itself is not one you need to rush out to find. Watch it if you're curious, but this one can be skipped.